I've probably walked past this window a million times, as it's on the route that's seperating me from where I work, and the closest available coffee. Quite an important walk considering it's for the all glorious beverage that is coffee, so I'm surprised I've never seen it before. This is on the side of an ancient Video Ezy (also a great place to buy caffeine) that's probably been long forgotten about. 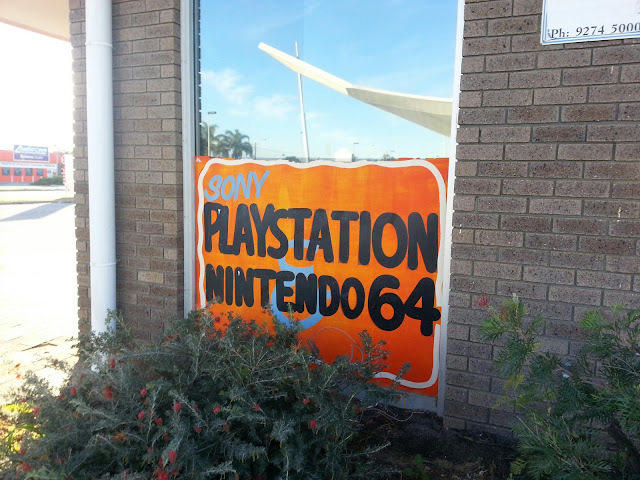 All the windows at the front of the building of course have all the latest consoles advertised, but this one remains my favourite. Hopefully the owner keeps on forgetting about it so the retro scene can still keep having a public presense (or a hidden one as it were).